Pronouns make up a small subcategory of nouns. The distinguishing characteristic of pronouns is that they can be substituted for other nouns. For instance, if you’re telling a story about your sister Sarah, the story will begin to sound repetitive if you keep repeating “Sarah” over and over again. Sarah has always loved fashion. Sarah announced that Sarah wants to go to fashion school. You could try to mix it up by sometimes referring to Sarah as “my sister,” but then it sounds like you’re referring to two different people. Sarah has always loved fashion. My sister announced that Sarah wants to go to fashion school. Instead, you can use the pronouns she and her to refer to Sarah. Sarah has always loved fashion. She announced that she wants to go to fashion school. 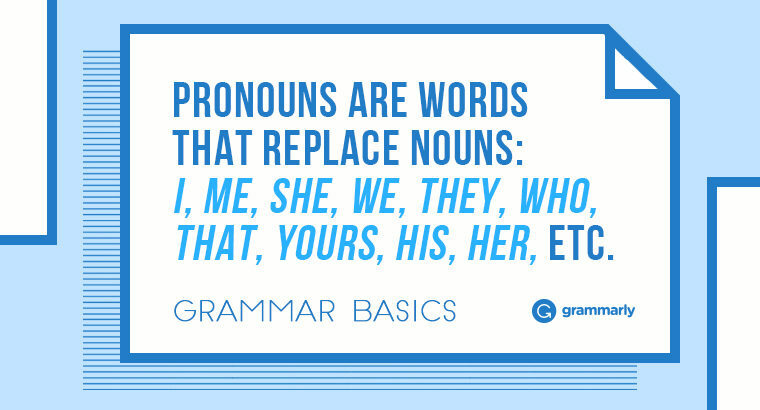 There are a few different types of pronouns, and some pronouns belong to more than one category. She and her are known as personal pronouns. The other personal pronouns are I and me, you, he and him, it, we and us, and they and them. If you learned about pronouns in school, these are probably the words your teacher focused on. We’ll get to the other types of pronouns in a moment. Pronouns are versatile. The pronoun it can refer to just about anything: a bike, a tree, a movie, a feeling. That’s why you need an antecedent. An antecedent is a noun or noun phrase that you mention at the beginning of a sentence or story and later replace with a pronoun. In the examples below, the antecedent is highlighted and the pronoun that replaces it is bolded. My family drives me nuts, but I love them. The sign was too far away for Henry to read it. Sarah said she is almost finished with the application. In some cases, the antecedent doesn’t need to be mentioned explicitly, as long as the context is totally clear. It’s usually clear who the pronouns I, me, and you refer to based on who is speaking. It’s also possible to use a pronoun before you mention the antecedent, but try to avoid doing it in long or complex sentences because it can make the sentence hard to follow. I love them, but my family drives me nuts. Relative pronouns make up another class of pronouns. They are used to connect relative clauses to independent clauses. Often, they introduce additional information about something mentioned in the sentence. Relative pronouns include that, what, which, who, and whom. Traditionally, who refers to people, and which and that refer to animals or things. The woman who called earlier didn’t leave a message. All the dogs that got adopted today will be loved. My car , which is nearly twenty years old, still runs well. Whether you need commas with who, which, and that depends on whether the clause is restrictive or nonrestrictive. Now that we’ve talked about relative pronouns, let’s tackle the one that causes the most confusion: who vs. whom. Who is a subject pronoun, like I, he, she, we, and they. Whom is an object pronoun, like me, him, her, us and them. When the pronoun is the object of a verb or preposition, the object form is the one you want. Most people don’t have much trouble with the objective case of personal pronouns because they usually come immediately after the verb or preposition that modifies it. Please mail it to I.
Ms. Higgins caught they passing notes. Ms. Higgins caught them passing notes. Is this cake for we? Is this cake for us? 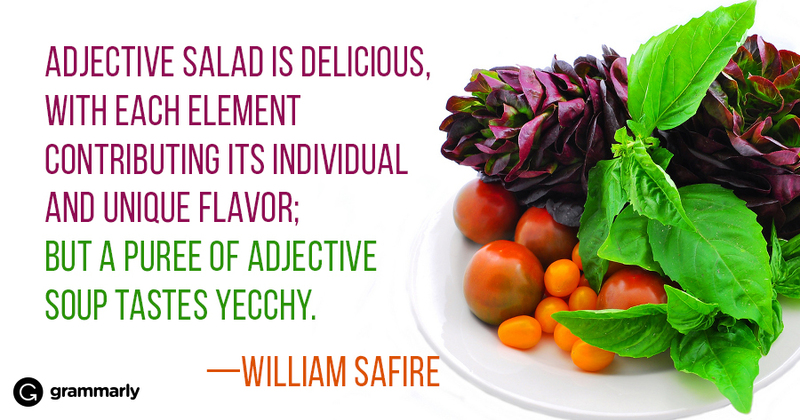 Whom is trickier, though, because it usually comes before the verb or preposition that modifies it. Whom did you speak to earlier? A man, whom I have never seen before, was asking about you. One way to test whether you need who or whom is to try substituting a personal pronoun. Find the place where the personal pronoun would normally go and see whether the subject or object form makes more sense. Who/whom did you speak to earlier? Did you speak to he/him earlier? A man, whom I have never seen before, was asking about you. Have I seen he/him before? Whom should I say is calling? Should I say she/her is calling? If the object pronoun (him or her) sounds right, use whom. If the subject pronoun (he or she) sounds right, use who. Before we move on, there’s one more case where the choice between subject and object pronouns can be confusing. Can you spot the problem in the sentences below? Henry is meeting Sarah and I this afternoon. There are no secrets between you and I. It doesn’t matter to him or I. In each of the sentences above, the pronoun I should be me. If you remove the other name or pronoun from the sentence, it becomes obvious. Henry is meeting I this afternoon. No one keeps secrets from I. It doesn’t matter to I. That, this, these and those are demonstrative pronouns. They take the place of a noun or noun phrase that has already been mentioned. This is used for singular items that are nearby. These is used for multiple items that are nearby. The distance can be physical or metaphorical. Here is a letter with no return address. Who could have sent this? What a fantastic idea! This is the best thing I’ve heard all day. If you think gardenias smell nice, try smelling these. That is used for singular items that are far away. Those is used for multiple items that are far away. Again, the distance can be physical or metaphorical. A house like that would be a nice place to live. Some new flavors of soda came in last week. Why don’t you try some of those? Those aren’t swans, they’re geese. Indefinite pronouns are used when you need to refer to a person or thing that doesn’t need to be specifically identified. Some common indefinite pronouns are one, other, none, some, anybody, everybody, and no one. Everybody was late to work because of the traffic jam. It matters more to some than others. Nobody knows the trouble I’ve seen. Reflexive pronouns end in -self or -selves: myself, yourself, himself, herself, itself, ourselves, yourselves, themselves. Use a reflexive pronoun when both the subject and object of a verb refer to the same person or thing. Henry cursed himself for his poor eyesight. They booked themselves a room at the resort. I told myself it was nothing. Intensive pronouns look the same as reflexive pronouns, but their purpose is different. Intensive pronouns add emphasis. I built this house myself. Did you yourself see Loretta spill the coffee? “I built this house” and “I built this house myself” mean almost the same thing. But “myself” emphasizes that I personally built the house—I didn’t hire someone else to do it for me. Likewise, “Did you see Loretta spill the coffee?” and “Did you yourself see Loretta spill the coffee?” have similar meanings. But “yourself” makes it clear that the person asking wants to know whether you actually witnessed the incident or whether you only heard it described by someone else. Occasionally, people are tempted to use myself where they should use me because it sounds a little fancier. Don’t fall into that trap! If you use a -self form of a pronoun, make sure it matches one of the uses above. Please call Sarah or myself if you are going to be late. Loretta, Henry, and myself are pleased to welcome you to the neighborhood. Possessive pronouns come in two flavors: limiting and absolute. My, your, its, his, her, our, their and whose are used to show that something belongs to an antecedent. Sarah is working on her application. Just put me back on my bike. The students practiced their presentation after school. The absolute possessive pronouns are mine, yours, his, hers, ours, and theirs. The absolute forms can be substituted for the thing that belongs to the antecedent. Are you finished with your application? Sarah already finished hers. The blue bike is mine. I practiced my speech and the students practiced theirs. Some possessive pronouns are easy to mix up with similar-looking contractions. Remember, possessive personal pronouns don’t include apostrophes. Interrogative pronouns are used in questions. The interrogative pronouns are who, what, which, and whose. Who wants a bag of jelly beans? What is your name? Which movie do you want to watch? Whose jacket is this?